Party season is fast approaching (seriously, when is it not?) and that means it’s time to brush up on your hosting skills! One of my favorite mixologists, the lively JP Caceres, will help guide you through five cocktail recipes at AGAINN this Wednesday, September 15 at an interactive cocktail class. 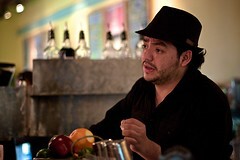 Starting at 6:30pm, JP will demonstrate how to make such classics as the Old-Fashioned, the Sazerac, and the Daiquiri. If you’ve never tried an original daiquiri, invented around 1900 in Cuba, you are in for a real surprise. In addition, enjoy a welcome punch called the Gun Hill featuring pisco infused pineapple, hibiscus, velvet falernum, and sage. Sounds luscious. JP is probably the least intimidating bartender I’ve ever met (ask for one of his business cards to see the best self-deprecating quote) and I’m sure will be a wonderful and fun teacher. The session costs $35 and reservations can be made by calling (202) 639-9830. I’ll be there, brushing up on my Sazerac skills, so please say hi!